Baby-O! - Activity songs for for baby lapsit program or playtime in a clear, folksy style. Developmental activities accompany lyrics. See songlist, listen to samples and digitally download the songs here. 1,2,3--Sing With Me! - For ages 0-3 years. 38 folksy, sweet, sing-along songs for babies, toddlers and preschoolers. These are the songs we sing at Parents Place. See songlist, listen to samples and digitally download here. ​Goodnight, Sleep Tight - MaryLee & Nancy perform classic lullabies with acoustic guitar, recorder, and beautiful harmonies. This gentle collection has been lulling little ones for more than 20 years. See songlist, listen to samples and digitally download here. Wee Chant - ​"World Beat" chants, songs, and lullabies from MaryLee’s music class for parents and their babies at Parents’ Place. Includes welcoming chants and celebration chants for special occasions in a newborn's life. See songlist, listen to samples and digitally download here. Limberjack Dancing Songs - Sing and play your Limberjack! These folk songs are just the right tempo and rhythm for Limberjack dancing! Sing along, dance and play with MaryLee! See songlist, listen to samples and digitally download here. Little Christmas - For ages 3 and up. Children's Christmas songs, rhymes and fingerplays performed in a clear, folksy vocal style accompanied by acoustic guitar, recorder, cello, violin, dulcimer and accordion. See songlist, listen to samples and digitally download here. ​Rhythm of the Rocks - For ages 4-9 years. A multi-cultural musical journey. Children singing along, creative acoustic guitar, recorder, and upbeat arrangements. Winner of the American Library Association NOTABLE Children's Recording and Parents Choice Silver Award. See songlist, listen to samples and digitally download here. ​Singin' Sidesaddle - For ages 4 and up. Sing-along songs of the old west. Acoustic, delightful cowgirl-harmonies, upbeat, acoustic, musical arrangements. See songlist, listen to samples and digitally download here. ​Whale Watching - For ages 3 and up. Winner of the American Library Children's Notable Recording and Parents Choice Gold Award! Folksy, upbeat, pop and fun sprinkled with some gentle lullabies. See songlist, listen to song samples and digitally download here. Mother Goose Melodies - ​For ages 3 and up. Parents Choice Award winning Mother Goose songs for little children performed by MaryLee. Folksy, clear vocals accompanied by acoustic guitar, recorder, dulcimer and lap harp. See songlist, listen to samples and digitally download here. Bella Notte - For ages 3 and up. Children's Italian music with fun, folksy arrangements of traditional and popular Italian songs, Breezy, clearly sung, dancing tempos for little feet. See songlist, listen to samples and digitally download here. Grasshoppers Three - For ages 3 and up. Bug songs--cute as a bug! Beautiful, clear vocals with guitar accompaniment. Great for family sing-along. See songlist, listen to samples and digitally download the songs here. 1,2,3--Boo! - For ages 2 and up. Not very scary Halloween songs for little kids! Imaginative, tuneful, sing-along folk songs by award winning children's singer-songwriter, MaryLee. See songlist, listen to song samples and digitally download here. 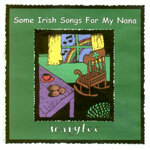 Some Irish Songs for My Nana - For ages 3 and up. MaryLee celebrates her Irish heritage with traditional and original songs. Gather the generations under the spell of tunes from the old days and the old ways. See songlist, listen to samples and digitally download here. A Winter's Eve - A great Christmas gift for adults or families. This is a beautiful collection of acoustic winter tunes from folk singer/arranger/multi-instrumentalist, MaryLee. See songlist, listen to samples and digitally download here. Irish Moon - Adult Contemporary Folk: Pretty, gentle, smooth female vocals in a recording of folk tunes, as well as the voices of her poetic and musical ancestors. See songlist, listen to samples and digitally download here. Sisters on a Journey - Birthing Chants, Doula Chants, Women Chants. See songlist, listen to samples and digitally download here.